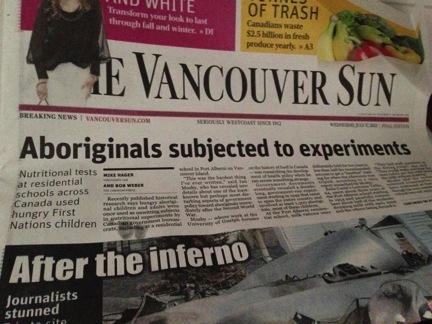 Just over a year ago, Canadian news outlets started to report on nutritional experiments that had been conducted on First Nations kids at Residential Schools. For a couple of weeks the stories continued to appear on the front pages of newspapers and on nightly newscasts across the country. Featured prominently in many of these stories was Ian Mosby, the historian who wrote the article for Social History/Histoire Sociale detailing the experiments that spawned the media frenzy. As I wrote at the time, it was particularly impressive how Ian navigated the media attention. It would have been easy for him to attempt to take centre stage and use the exposure to further his career. Instead, he was steadfast in ensuring that the story remained the focus. In the year since, Ian has continued to shed light on the experiments and their long-term ramifications. (Check back tomorrow for a podcast of a talk he delivered in the fall at Acadia). As he wrote in his wonderful piece “Of History and Headlines: Reflections of an Accidental Public Historian”, the stories that have emerged in the past year from survivors of these experiments have been powerful and serve as a reminder of the humanity that can occasionally be lost in studying the humanities. For as much as Ian stayed in the background during the story, however, I was curious to know what exactly the experience was like. 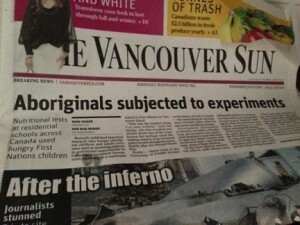 After all, it’s not every day that an article you write spawns front page stories across the country. Dealing with the media (I’ve done some radio interviews on my research on the CBC) can be difficult, time consuming, and intimidating. At the same time, however, it can be fun and rewarding. In this episode of the History Slam, I talk with Ian Mosby about the media storm that surrounded his article on nutritional experiments at Residential Schools. We chat about the research, the public reaction, and what has happened since the initial article was published. We recorded this episode in February, since which Ian has moved from the University of Guelph to McMaster University where he is the L.R. Wilson Postdoctoral Fellow.